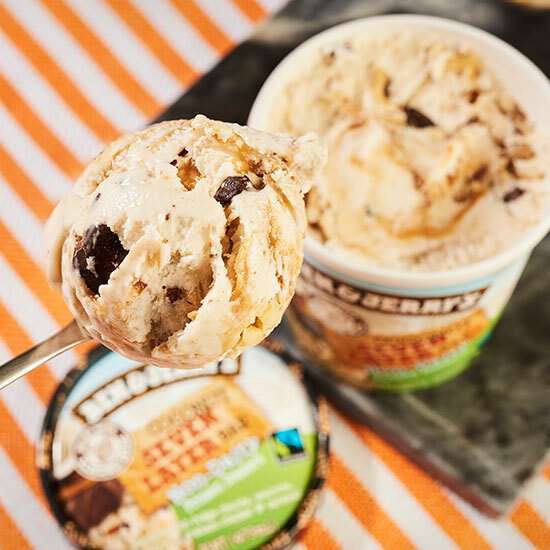 Despite the milk industry's efforts to delegitimize the "milk" part of almond milk, Ben & Jerry's has already embraced the apparently controversial beverage to create a line of vegan ice cream options. And now, a year after its grocery store debut, we've got three new non-dairy ice cream flavors to scream about. Classic flavors Cherry Garcia and Coconut Seven Layer Bar, as well as newcomer Caramel Almond Brittle, have been added to the company's frozen dessert offerings. The delicious trio joins other non-dairy options like Chunky Monkey, Chocolate Fudge Brownie, PB & Cookies and Coffee Caramel Fudge, which confirms that vegan is still totally on trend for 2017. News of these particular flavors doesn't come as too much of a surprise. Both Cherry Garcia and Coconut Seven Layer Bar were spotted in Philadelphia last week, to which a Ben & Jerry's spokesperson commented: "We cannot confirm nor deny the new non-dairy flavors coming to shelves in 2017 – that we’ll be announcing in the middle of February – no matter how delicious they are." Now that we've gotten our highly-anticipated, albeit underwhelming announcement, one can only imagine what Ben & Jerry's will roll out next. Vegan cones? Vegan whipped cream? Vegan ice cream sandwiches? We certainly wouldn't be disappointed with vegan versions of these guys.